Privacy first and foremost. 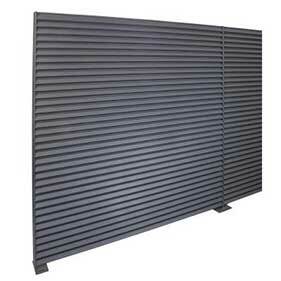 This is the objective of Talia® Screen Ventus, which thanks to a deeper louvered profile when compared with the standard Talia® one, ensures a lower degree of see-through visibility. However, the absolute guarantee of quality and the high aesthetic value that sets apart the whole Talia® range, made using quality materials and the typical Made in Italy style, it remains the same. 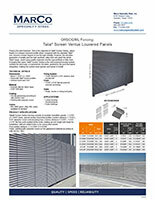 Talia® Screen Ventus fencing consists of modular monolithic panels, 1 13/16″ x 5 13/64″ mesh, special section horizontal profiles (center distance 1 13/16″ ), 5/32″ diameter round vertical joining bars (center distance 5 13/64″). 3 5/32″ x 5/16″ flat bar posts welded at the ends, making up one single unit ready for installation, with pre-drilled holes to fix consecutive panels. Post centres distance: 5′-4 61/64″-6′-6 47/64″ Finish: painting with polyester resins on hot galvanized material according to UNI EN ISO 1461. We invite you to contact Marco Specialty Steel today to learn more about the wide range of fencing and louvered panel product options. We’ll also be happy to provide a no-obligation estimate.